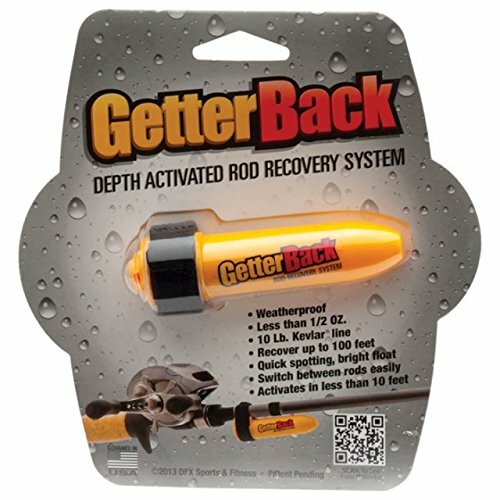 The GetterBack Fishing Rod Recovery System is a small gadget that uses velcro straps to attach to your fishing rod. If your rod is dropped into the water, after a few minutes, the device will release a float attached to 100′ of Kevlar line. Once the float bobs to the top, you can pull it up to recover your fishing rod (or anything else under about 10 lbs). In addition, some forward-thinking folks are using these on drones as well just in case they go down in the water. Don’t get me wrong, getting back a $140 fishing rod and reel is worth getting one of these but, an $800 drone? well, better get two to increase the chance of recovery. Oh sure, the water will probably make your drone un-flyable but, at least you’ll be able to salvage some parts. Dimensions: 3.5 x 1 x 1 inches. Activates in less than 10 ft. of water. Recover objects at up to 100 ft.
10 lb test-weight Kevlar line. It might work for heavier objects but, don’t bet on it.